World Cup 2026: Can the North American hosts get along? The US, Canada, and Mexico will be co-hosting a massive three-country football extravaganza in 2026 - the Fifa World Cup tournament. Can the beautiful game be a unifying force for the North American nations? There was some doubt that the United Bid could pull it off, but in the end, it finished with aplomb, winning 134 votes on Wednesday from Fifa member nations compared to 65 for Morocco, the other potential host. This will mark the first time three nations have been picked to co-host the massive international sporting event. It's a show of North American unity that comes at a tough time for the hosts. 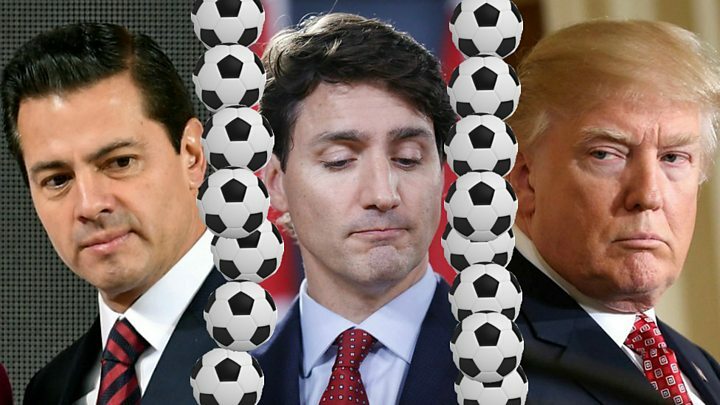 Canada and Mexico's relationship with the United States has hit a rough patch but the three nations will host the biggest World Cup in history. There will be 48 teams and 80 matches, and the North American event is projected to make an $11bn (£8.1bn) profit for world governing body Fifa. But while things look rosy on the football front, here's a glimpse at how the three countries are currently getting along at the political level. Mexico was a favourite punching bag for Donald Trump throughout his 2016 presidential bid. In his campaign launch speech, he warned that Mexico was sending its "drug-dealers, criminals and rapists" into the US. He derided a US-born federal judge's Mexican heritage. The highlight of his political rallies often came when he would promise to build an impenetrable wall along the 3,000-mile US-Mexico border - paid for by Mexico. With this as a backdrop, US-Mexico relations were poised for a rocky time during the Trump presidency - and, by and large, that's the way things have played out. A planned meeting between Mr Trump and Mexican President Enrique Pena-Nieto shortly after the US president's inauguration was scuttled after Mr Trump suggested a tax on Mexican imports. Another planned Washington visit in early 2018 was scrapped because of disputes over the proposed wall. At this point, Mr Trump's mere mention of Mexico and the wall prompts an angry response from Mr Nieto or his government. These ongoing heated exchanges, in addition to recently imposed US tariffs on Mexican steel and aluminium imports, have complicated the ongoing attempts by the US, Canada and Mexico to renegotiate the North America Free Trade Agreement (Nafta). Administration officials have hinted that they may eventually decide to scrap the deal entirely and push for a one-on-one trade arrangement directly with Mexico. Meanwhile, Mexico's presidential election looms a few weeks away. Left-wing populist Andres Manuel Lopez Obrador is the favourite, and his election could be an opportunity for a reset in US-Mexico relations - or for trade negotiations to grow further acrimonious as economic nationalists on both sides of the border escalate the dispute. Canada considers itself one of America's greatest friends and allies - a North American teammate. They share the world's longest undefended border, business and trade are highly integrated, and they have a long-standing defence relationship. But the friendship is feeling frayed these days amid angry exchanges and trade tiffs. After a contentious G7 summit hosted by Canada, Prime Minister Justin Trudeau warned the country wouldn't "be pushed around" by the US on trade. For US President Donald Trump, that comment was offside. He snapped back, calling Mr Trudeau "meek and mild" and "dishonest and weak" and saying Mr Trudeau's words would cost Canadians. Meanwhile, the two nations are locked in a trade dispute over the US steel and aluminium tariffs, over the Nafta renegotiations, and over levies on softwood lumber and newsprint. Canada has filed complaints with the World Trade Organisation and has announced retaliatory tariffs against the US. After the US imposed metals tariffs on key allies, Mr Trudeau reminded the US that Canadian soldiers had been fighting and dying alongside their American counterparts "from the beaches of Normandy to the mountains of Afghanistan". And Mr Trudeau scrapped a recent US visit over Nafta demands from the US his government found unacceptable. There are more storm clouds on the horizon, with the US weighing potential car and car parts tariffs. This is a North American relationship that's working. At the end of 2016, Canada lifted a visa requirement for Mexican visitors as part of an effort to improve bilateral relations. The visas, first imposed in 2009 after Canada saw a spike in refugee claims from Mexico, was an irritant between the two Nafta members. Mexico, which was among the US allies to be hit with US metals tariffs on 1 June, joined Canada in retaliating against the US - with $3bn worth of tariffs. Last October, Mexican President Enrique Pena Nieto said the two nations "are going through one of the best moments of our relationship".